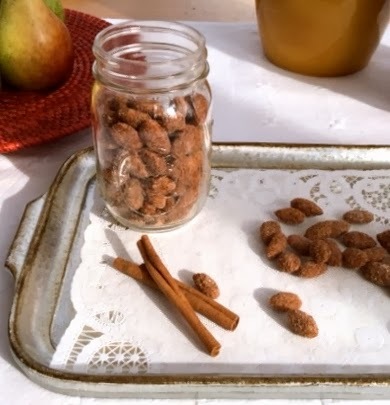 This is a simple recipe for Cinnamon Roasted Almonds that doesn't require any fancy ingredients or equipment. I make a few batches at once for both snacking and to give as gifts.They make a nice addition to a plate of goodies that you're giving away, sprinkled around cookies and truffles, or tied in a small bag to go with a gift. They're very easy, taste wonderful and make your house smell yummy. Spread evenly into two greased 15-in. x 10-in. x 1-in. baking pans. Bake at 300° for 25-30 minutes or until almonds are crisp, stirring once. Cool. Store in an airtight container.